These two pictures are of a 30 figure SYW Prussian Battalion (1st battalion IR12 von Finck). I'm just finishing off the second battalion of this regiment and it should be done by the weekend. Not sure about my photographic skill though. I think I need to clean the lense. These figures are, again, the 40mm from S&S. What I will try to do tomorrow, time permitting, is to get a photograph showing 40mm, 25mm and 15mm together. 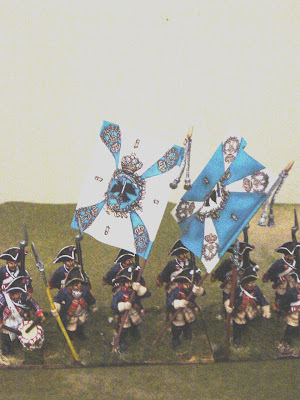 Next weeks project is 2 more Prussian battalions, this time in 15mm.